This is my go to breakfast at the moment. I was hesitant about sharing it because of its simplicity. Porridge is a common breakfast food that everyone enjoys and is easy to personalize. However, it wasn’t until I shared an oatmeal photo on my Instagram Story that I found out how passionate people are about their oats. Friends asked me how I prepared them and what kind of oats I used. So I took it upon myself to get serious about my oats and create my ideal oat recipe. Steel cut oats are minimally processed, therefore they take longer for your body to digest, avoiding a spike in blood sugar levels and keeping you full longer. Instead of just boiling my oats I toast them in the pot first. This helps develop their nutty flavour. For a more nutritious breakfast I mix super seeds into the oats. This adds texture and fiber. Fruit compote is a great way to add sweetness to your oatmeal instead of honey, maple syrup, or brown sugar. Cooking fruit with a touch of maple syrup gives you delicious syrup. It’s also reminiscent of pie, which is always a good thing. Gut health is important and yogurt adds an unbeatable creaminess to your oats. This recipe is written in a meal prep style so it can be put together rather quickly in the morning. I don’t think you will be the hitting snooze button anytime soon with this breakfast recipe to look forward to. A make ahead recipe for busy mornings. Begin by toasting the oats. In a pot over medium-high heat add the oats and and dry toast for a few minutes until they have turned a shade darker and you can smell the nutty aroma. Add the water and bring to a simmer. Cover and stir occasionally for 15 minutes. Remove from heat and set aside. You can store in fridge for future use. Place all the cherry compote ingredients in a pot. Stir and bring to a boil. Allow to simmer for 10 minutes or until cherries are soft and juice has released. Remove from heat and discard vanilla bean. You can store in fridge for future use. Combine the oats and almond milk and reheat, stirring until creamy. Remove from heat and stir in the seeds. 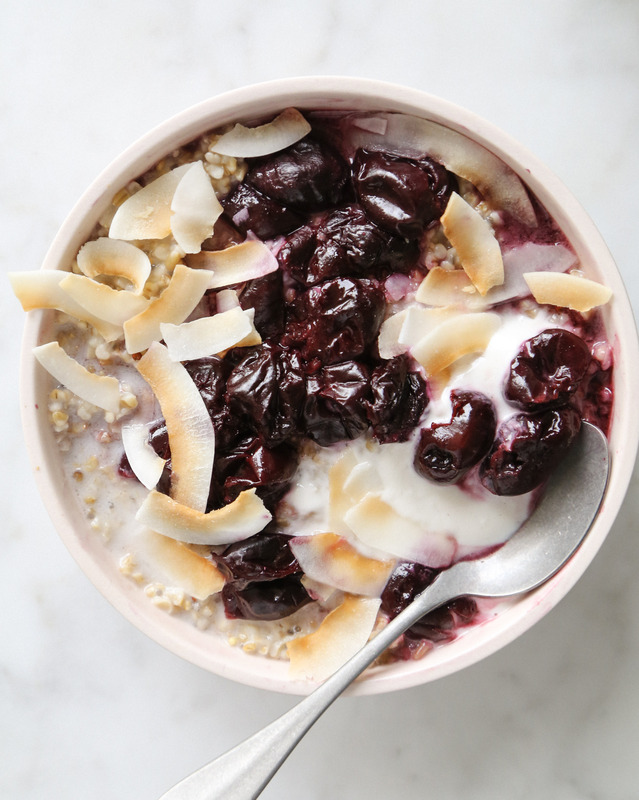 Top with coconut yogurt, hot or cold cherry compote, and toasted coconut flakes. This entry was posted in Breakfast and tagged breakfast, cherries, coconut, coconut yogurt, oatmeal, oats, porridge, steel cut oats. Bookmark the permalink.